Those from thenextweb managed to get their hands on an iPhone 4S and were going to do, some tests against Samsung Galaxy S II and Motorola Droid Bionic devices. Galaxy’s from the Samsung is praised as the most powerful Android smartphone but the iPhone from Apple proves to be faster in tests made by thenextweb. iPhone 4S runs on iOS 5 but unfortunately do not know what versions of Android are running on the smartphones from Samsung and Motorola. In the first test the score was verified in the SunSpider benchmark and Apple iPhone first came out with the best result. 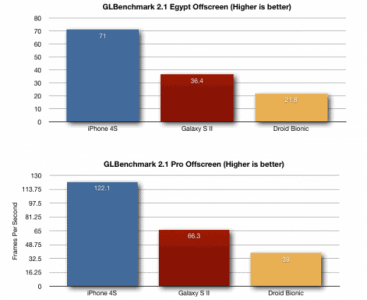 In the Browsermark test we have the same performance best of iPhone 4S with a much higher score than its rivals. I guess Samsung’s latest version of the test does not run on Android OS which seems significantly improves browser performance long enough that it is close to the iPhone 4S with iOS 5. After browsing among the test comes on the device’s ability to run the most powerful games and iPhone 4S has out again way ahead of its competitors with a score twice of the Samsung Galaxy S II and triple from the Motorola Droid Bionic. The iPhone from Apple’s has a PowerVR SGX 543MP2 graphics chip, ie a dual core graphics chip identical to that of iPad 2. Samsung Galaxy S II has an ARM Mali 400 graphics chip and Motorola Droid Bionic has a PowerVR SGX540, older than the iPhone 3GS/4. In conclusion iPhone 4S is, according to tests of the thenextweb, stronger than the Samsung Galaxy S II and Motorola Droid Bionic devices but I think that Samsung has not been tested using the latest version of the Android OS available for it.